I held up the photograph, all crisp greys and soft lines, and asked: Who is the beautiful bride? She had fierce eyes, no smile and pale hair covered in what I now know, so much later, was orange blossom and very fine lace. I was asking this of one of my grandmothers, the one who was my mother's mother, who would speak through almost-clenched teeth and seemed, in addition to irritation, to feel a persisting disappointment. She looked at me from above the deep half-moons of lined skin that puddled below -- it came to me just then -- those eyes. My snapshots, with their slipshod focus, the way they yellowed sunlight and thickened indoor light, are bad records and yet perfect in one way: they look to me the way memory looks in my own mind, as though it has been trapped in amber. When we were in high school we took a lot of photos with cartridges and flash cubes as we piled into pleasant dens and rec rooms in north London, around and near the university gates, with playing cards, squat brown bottles of beer, red packets of du Mauriers, and Night Moves and Rumours and Hotel California. We took photos when we skied through our pretty, yellow-brick neighbourhoods in the great Southwestern Ontario snows of the late 1970s, free of school for days at a time. With a parent's station wagon, a phlegmy transistor radio and thoroughly inadequate sunscreen we passed torpid afternoons on the sands at Grand Bend -- more photos. We had different geometry then, in our cruddy Instamatic photos. Our cheeks were fuller and higher and our jaws and hips neat and narrow. We were reedy and sensitive and alive to the moment. We thrummed like elastic to wit and hilarity, to longings, to shame. We were bound by conventions we broke only by risking trouble in a surprising range of shades. We forget some of it and then marvel at the caprice of what we do remember -- and wince at the long-delayed understanding that comes, sometimes, out of nowhere. Alchemy. Fingers on my forehead, eyes pressed shut. The late Eric Wright described the stunning fact of meeting again the only people who share those tecollections. At the close of his very affecting memoir of growing up in a large, poor English family between world wars, Always Give a Penny to a Blind Man, he joins a reunion with his schoolmates. There they are, all wearing masks, he is suddenly convinced, masks of the faces of old men. At a reunion recently I thought about all of this again and began to tinker with this story, which I began a few months ago. I didn't see masks of old men or women among the people I knew from that time, which proved to be both crucible and fleeting breeze. But I wish for us all to get there, to be old and blurry-edged, soft-voiced with age, and still enjoying, every once in a long while, the novel familiarity of being together once again. 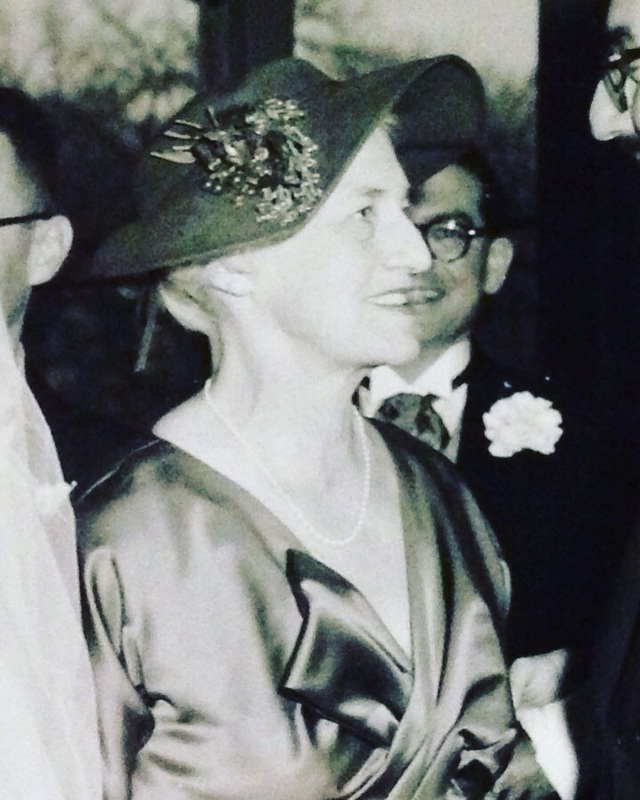 Somewhere between her striking wedding photo and the time that I asked her about it, many years on, a very handsome grandmother.